US 3rd Marine Division leathernecks disembark on the beach from an LVT-1 of the 3rd Amphibious Tractor Battalion during training for the invasion of Guam on Cape Esperance, Guadalcanal during the week of May 12, 1944. The "alligator" was developed as a disaster rescue vehicle after a number hurricanes caused severe damage to Florida in the late 1930s. Developed and, in part, financed by its inventor, Donald Roebling, grandson of the Brooklyn Bridge builder, it came to the attention of the US Navy when it was featured in the October 4, 1937, issue of LIFE Magazine. After refinements paid out of his own pocket, and the refusal of the US Navy to purchase the available version, the US Marine Corps took over the project. A combat version was designed in 1940 and tested and accepted by the Marine Corps. This LVT-1 had welded steel instead of aluminum, a more powerful engine, and provisions for one or two .30 caliber Browning machine guns. 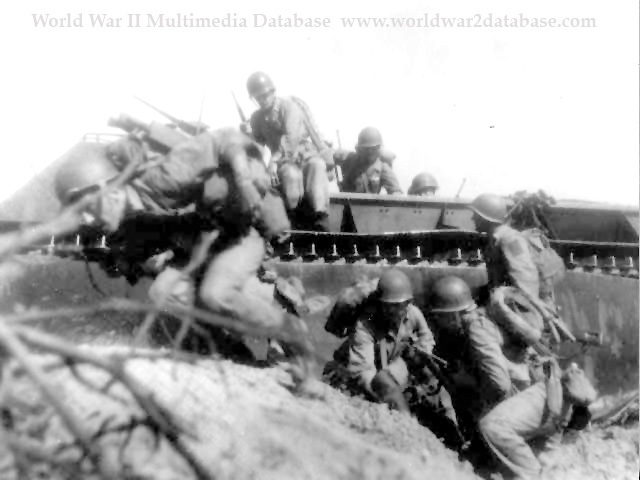 The first of the production LVTs would roll off the Food Machinery Corporation's (FMC) assembly line in July 1941. LVT-1 Alligator Amtracs (Amphibious Tractors) were first used at Guadalcanal in August 1942 and made a combat landing under heavy fire during the invasion of Tarawa on November 21, 1943. Their last combat operation was the invasion of Cape Gloucester, New Guinea in December 1943. The 3rd Amphibious Tractor Battalion upgraded to the LVT-2, which had improved armor and could carry more cargo. The unit had 180 LVT-2 Amtrac when it landed the 3rd Marine Division on July 21, 1944 on the beaches of Asan Point, Guam.